Gamble like royalty – with Just Jewels™ deluxe! Just Jewels™ deluxe will have you feel like royalty in no time! Play the exquisite Vegas slot today on Gaminator – entirely for free! 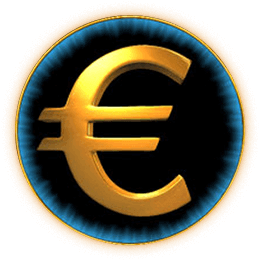 The golden EURO symbol is the Just Jewels™deluxe slot game Scatter symbol. Get three of them on any reel at the same time to trigger free spins. If you are lucky enough to get three adjacent crowns on the right, the middle or the left side of the Just Jewels™ deluxe game, you will be rewarded with an extra winning. Across five reels and along up to ten win lines your goal will be to amass as many riches as you can. Various precious gem stones and priceless jewelry will fall prey to your ambition, and scatters and wilds will help you achieve the biggest jackpots you could ever dream of! Win symbols are tiered by rarity and gem stone cut. Radiant cut emeralds and amethysts in cushion cut comprise the base tier of possible win symbols. They usually appear quite commonly, and you should face little trouble aligning up to five of them in any given round. Tear-shaped sapphires and brightly shimmering rubies in heart cut are rarer, their win multipliers are increased by 20%. Gold bars and stacks of cash share the same tier, both upping your win multiplier by up to 20 times! The casino hit now on Gaminator! Just Jewels™ deluxe also features the Euro symbol as scatter, not only helping you out with another multiplier of up to 20 times your initial stake, but also helping you complete win combinations across all reels. 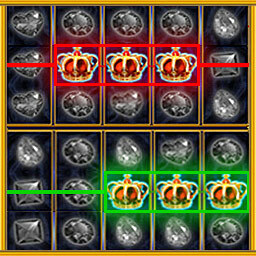 The highest possible win during a regular round is scored by aligning between three and five crowns next to each other. Showering you in riches, this opulent part of the crown jewels will net you are hefty 200 times multiplier of your stakes – one of the highest ones achievable in the Gaminator Online Casino. Become a King on Gaminator! We have all the empirical data to know this slot machine is very popular with all players, not in the least because of the detailed, carefully animated win symbols and overall ambiance – certainly huge payouts are a contributing factor, too! Millions of players keep her reels spinning every day, not just on Gaminator! If you have played other slot games developed by Novomatic before, then surely the gamble feature will need no introduction. Entering this mini game is possible at the end of every round. A deck of cards will be shuffled and cut at a random position, five cards will be displayed and you get to guess what color the next flipped card might be. If you guessed right, then you just doubled your winnings this round. If not, well, then we wish you all the best for your next round! Gaminator mobile+ is a free online game for entertainment purposes only. You cannot win real money or real items/services by playing our free slot machines. The virtual currency used in this game can be purchased in the in-app Shop using real money. Gaminator credits cannot be exchanged for cash or be paid out in any form; they may only be used to play this game. All casino games in this app are intended for adult audiences only..